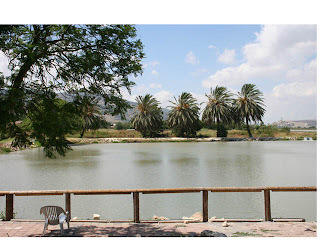 This week, I received a report from Howie in Jerusalem, describing his fishing trip to Dag-Bakfar (A Fish in the Village) fishing park located in the north of Israel. Thank you, Howie for this information and for the great pictures! I am pleased to report back to you about our successful fishing outing this past weekend at Dag-Bakfar Fishing Park in the Yokneam Moshava. 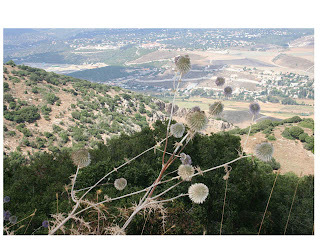 Our ninety-minute drive north from Jerusalem via Highway #6 to Highway #7 went very smoothly. The ninety-minute drive will soon be reduced by at least thirty minutes when the new extension of Highway 6 opens up shortly. 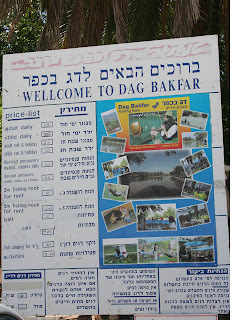 The Dag-Bakfar Fishing Park is located in the Jezreel Valley - עמק יזרעאל. It is a great first time fishing spot for anglers of all ages wishing to enjoy this recreational past time. 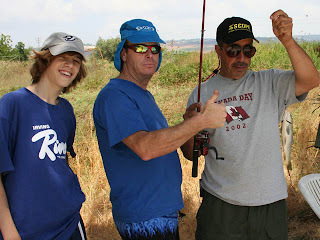 The Yokneam Moshav facility offers all the services one needs to catch their first big one. The friendly hosts greet you in the language of your choice. The admission for groups of four can be reduced by visiting their website and downloading a free admission coupon for one member of your group of four. 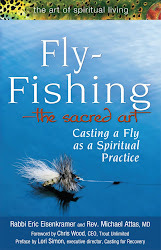 Our fishing party consisted of three adults and two children. As the only one with previous fishing experience I happily spent most of our five hour visit helping untangle lines, putting fresh bait on the hooks and making sure everyone was happy. There were about twenty fishermen trying their luck around the lake. Chairs, tables and lots of shaded areas are provided for you. Everyone seemed to have their own gear. I used my regular rods. I did notice that the more successful anglers used 3 meter and 5 meter poles to cast even further into the lake. These longer poles could be rented from the fishing shop at a minimal price. My son and his friends had a great time. We lost a few large ones when they were being brought in. We were using a ten pound test line. The lake was stocked with some pretty healthy looking Carp and a couple of unknown species to me (I thought I may have seen some cat fish?). We caught and released our catch. The fish looked clean and easily ready for consumption. You are able to select live fish from a special holding tank and have the Daf-Bakfar staff clean it for you. I did notice some guest’s bring their catch in the recreational park beside the facility. We had a great time at Dag-Bakfar. It was my first experience at a fishing park in Israel. They cater to all ages and groups. Overnight facilities are available at Dag-Bakfar, reservations are recommended. 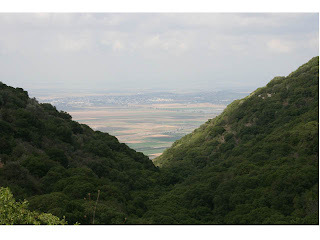 I would also suggest scheduling some time to visit the surrounding mountains in עמק יזרעאל Valley of Jezreel. We concluded the day with a jeep ride through Mount Carmel. The road was difficult to navigate but worthwhile. We stopped off at a local Druze Village near Haifa for some local food and headed back south to Jerusalem. Great letter; thanks for sharing it. Now I want to go fishing in Israel!